Only 2 more days until the Holiday Sample Sale at Egg Press begins in Portland! I've joined up with Egg Press, Eleven Collection and Picaflor for this popular annual event, taking place November 18–20, 2010. 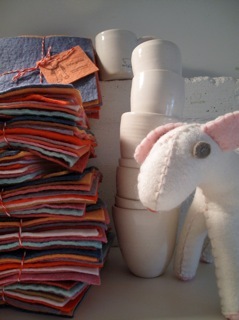 Kata Golda: Hand-dyed wool felt, craft supplies, blank books, photo albums, embroidered tea towels, ceramic cups, little felt goods. Sale prices range from $5 - $25. Read about other Kata Golda events taking place this holiday season, including a workshop at Modern Domestic. Egg Press: All cards are $1 each, or $5 for a box/bundle. Discontinued Egg Press onesies are $10, seconds are $5. Our “Tees while you Wait”* carousel will be fired up with four new designs — choose one of our four available sample sale designs for our master screenprinter to apply to your t-shirt, tea-towel, pillowcase, table-runner, etc. ; just $5 per design, per print. And any time you spend $50 or more you will be entered into our drawing to win a special Egg Press prize. Picaflor: Cozy knits for infants and kids, sizes NB-7/8y. Pricing will be $5 - $25. Eleven Collection: Shoes at $25/pr. Sizes 9-3. And a select number of styles from See Kai Run, sizes 3-9 and smaller (0-6 months and 18-24 months) at $17/pr. Hanukkah: Order by 11/26/10 to receive items by 12/1/10. Christmas: Order by 12/16/10 to receive items via UPS Ground by 12/1/10. Order by 12/20/10 to receive items via UPS Air by 12/24/10. Kata Golda's Going to Portland!